Author Ralph Hayes has penned an incredible amount of action novels. He launched his vigilante inspired series 'The Hunter' in 1975. Adding to the surplus of genre paperbacks, Leisure released five books of the series that same year. 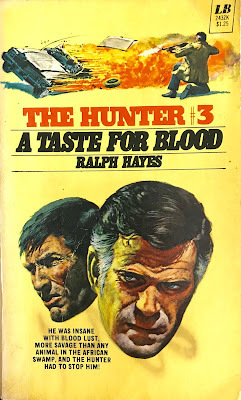 With book number three, “A Taste for Blood”, the formula is altered. Instead of series heroes John Yard and Moses Ngala tracking criminals, the two are thrust into a harrowing survival yarn that doesn't involve firearms. This cabaret of characters, including Yard and Moses, boards a Cesna plane in Narobi departing for the city of Khartoum in Sudan. Yard, suspecting the plane requires much needed repairs, hesitantly agrees to board while questioning Bourke's flying skills. About 200 miles north of Juba the plane crashes into a desolate stretch of swampland. Very little water and food forces the group on a trek to civilization. That's Hayes backdrop, and he does a splendid job fashioning an action-adventure story out of a plane crash survival recipe. There's immediate discord in the ranks as the arrogant Bourke refuses to leave the plane. Factions are formed and eventually they all agree to designate Yard the leader. Soon, Chi-Han begins to calculate rations and bodies, positioning himself to conveniently kill a few of the group in the night. Osman's background as a terrorist makes for an easy alliance, and the book eventually moves into Yard/Moses vs Chi-Han while supplies run out. Hayes is terrific here, making 'The Hunter' series 3 for 3. The intrigue, deception and fortitude are all variables in this human experiment. Sure, the jungle adventure has been done to death (Hayes may have taken liberties with Robert Westerby's 1969 novel “The Jungle”) but the last 25-pages places the action on urban streets and plays on the general vigilante theme of the first two novels. The end result is another stellar effort from an under-rated author.